To do that which it is right to do..." is the guiding force for Scottish Rite Masons, which we share with the community. The Valley motto: “To do that which it is right to do…” Albert Pike tells us what Omaha Scottish Rite Masons believe in and share with the community. Our members build upon the ethical teachings and philosophy offered through the dramatic presentation of the individual degrees. Interest of a man to become member of the Scottish Rite will require him to first become a member of a Masonic Lodge and receiving the First (Entered Apprentice) Degree, the Second (Fellowcraft) Degree and the Third (Master Mason) Degree. He will start his Scottish Rite journey with the Fourth (Secret Master) Degree and continue through the 32nd (Master of the Royal Secret) Degree. The Ancient and Accepted Scottish Rite of Freemasonry (the Northern Masonic Jurisdiction in the United States often omits the and), commonly known as simply the Scottish Rite, is one of several Rites of the worldwide fraternity known as Freemasonry. A Rite is a series of progressive degrees that are conferred by various Masonic organizations or bodies, each of which operates under the control of its own central authority. In the Scottish Rite the central authority is called a Supreme Council. Being a Scottish Rite Mason has many advantages. It builds your character and opens up your social network to a wide variety of men from many different walks of life. After you have become a Master Mason it is natural to continue your education through the Scottish Rite. Starting the 4th Degree with the Secret Master reflecting on duty and honor to God, Country and yourself. Degrees continue from the 4th Degree continuous to the 32nd Degree where a man becomes a Master of the Royal Secret. Learning the most important duty is to yourself. These degrees are performed as a play during a Reunion (initiation). If the apron is a badge of a Mason in Blue Lodge, the cap can be said to be the public badge of a Scottish Rite Mason. It is considered a part of the uniform and the different colors indicate the degree of the wearer (these are prayer caps and are only worn within the Valley during meetings and Reunions). Our members build upon the ethical teachings and philosophy offered through the dramatic presentation of the individual degrees. Interest of a man to become member of the Scottish Rite will require him to first become a member of a Masonic Lodge. Joining the Scottish Rite builds your character and opens a social network of men who have been on the same journey. If not for Scottish Rite there may never be a chance to meet some but as a member you would find them a friend. The light blue cap denotes that the wearer has been a Scottish Rite Mason for 50 years or longer, a true distinction in our fraternity! There are a dizzying array of caps at the Scottish Rite, and they can be confusing! While the Masonic apron descends from the tradition of the operative craft of medieval stonemasons, the Scottish Rite cap comes down to us from the medieval chivalric tradition. When the Master Mason receives the Thirty-Second Degree and dons the black satin headgear of the Scottish Rite, the Masonic craftsman is elevated to an order of Masonic knighthood. 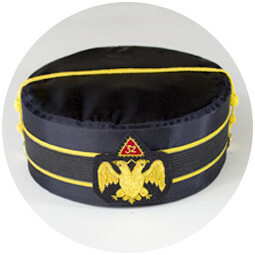 As the apron is the regalia of a Craft Mason, the cap is the regalia of the Scottish Rite Mason and should only be worn during a regular Lodge meeting. The Scottish Rite cap is both a prayer cap in the Jewish tradition and a symbol of the Scottish Rite Mason as a soldier in the "Empire of Intellect, Reason, Philosophy, and Wise Morality" (32°). Similarly, a cap was worn by English knights, including the Templars, was later given a military significance by British regimental soldiers in the 19th century. The Supreme Council adopted the present caps in 1927. When a Scottish Rite Mason has taken the 32° Master of the Royal Secret he is entitled to wear a black hat with gold ribbons and the Double Headed Eagle symbol. You will often hear to 32° Scottish Rite Masons referred to as "black hats," just as 32° KCCH or 33° referred to as "red hats" and "white hats" respectively. A Scottish Rite Mason who is over 35 years of age, a member of the Valley at least 46 months may be nominated for extraordinary service to the Valley, Public or in his community. If elected he is invested as a32° Knight Commander of the Court of Honour (32° KCCH). The hat is red with gold trim and a Cross in the front. A 32° KCCH Mason who has held that honor a minimum of 46 months may be nominated to become a 33° Honorary Inspector General (33° or 33° IGH). As with the KCCH, nominations are made for extraordinary service within the Valley, in Public or in his community. The hat is white with gold trim and a double cross. The 33° Grand Cross is a special designation given to a few Scottish Rite Masons who have given service to the Supreme Council or been a leader in a Valley for many years. There are usually only about 50 living 33° Grand Cross members in the Southern Jurisdiction. A Scottish Rite member within the Orient may be appointed a 33° Deputy of the Supreme Council. He is the Orient leader with all authority for leadership within his Orient as stated in the Supreme Council Statutes. A Deputy of the Supreme Council in an Orient may be nominated to the Supreme Council. If elected, he becomes 33° Sovereign Grand Inspector General in his Orient and a member of the Supreme Council. There are only 33 active members of the Supreme Council.